There were emotional scenes in Lisbon today at an event involving Malta’s entrant in the Eurovision Song Contest, Christabelle. The Ministry of Health in Portugal teamed up with a leading University research centre and the singer to send a message of hope about mental health. When a member of the audience tried to put a question to Christabelle, she broke down in tears and Christabelle left the panel to give the young woman a hug. Christabelle, Malta’s entrant in the contest, has had to deal with mental health issues herself and her song, “Taboo”, sends a message to everyone who is struggling about the need to seek professional help. Christabelle, and Dr. Paula Domingos on behalf of Professor Miguel Xavier, Director of the National Programme for Mental Health from the Ministry of Health, appeared at today’s event organised by the Lisbon Institute of Global Mental Health. The institute forms part of the Nova Medical School, Universidade Nova de Lisboa. Professor José Miguel Caldas de Almeida, Director of the Institute and Coordinator of the EU Joint Action on Mental Health and Wellbeing, also addressed the meeting. The Maltese singer gave an acoustic rendition of her song and spoke of the need to break down the taboos surrounding the issue. The meeting also heard, in video messages, from the Deputy Prime Minister and Health Minister of Malta, Dr Chris Fearne, and the President of Malta, Marie-Louise Coleiro Preca. They wished the singer well in the contest and praised her activism. Professor Caldas de Almeida told the meeting that many people with mental health problems face abuse and discrimination and spoke of the stigma that made people hesitate to seek help. He said about 22% of the population of Portugal suffered a mental health condition. He thanked Christabelle for giving this issue a voice at Eurovision. Dr Domingos told Christabelle she was very brave to tell her story, and demonstrated that she wasn’t afraid to be judged. Christabelle will perform in the second semi-final of Eurovision at the Altice Arena in Lisbon on Thursday 10th May and, if she qualifies, in the final on Saturday 12th May. 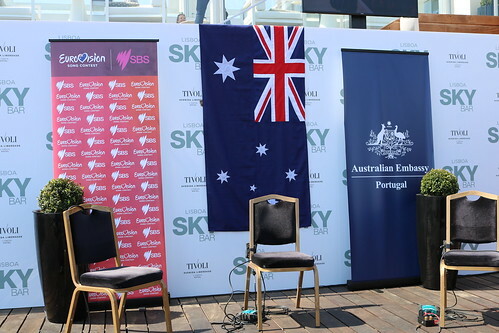 Once again esckaz.com were invited to the Australian Embassy event - this time in the Eurovision 2018 host city Lisbon. The delegation from Australia always produce a great event, with complimentary food and drink and a chance to mix and mingle with other journalists, delegations and Embassy staff including his excellency the Ambassador for Australia in Lisbon and the the Chief executive of SBS Australia, Michael Ebeid. As always the event was in the sumptuous surroundings, this time it was the Sky Bar Lisboa based in one of the top hotels in Lisbon, The Tivoli. Eurovision Champions Ireland and their Head of delegation Michael Kealy..
Read more about Eurovision Champions Ireland and their Head of delegation Michael Kealy.. 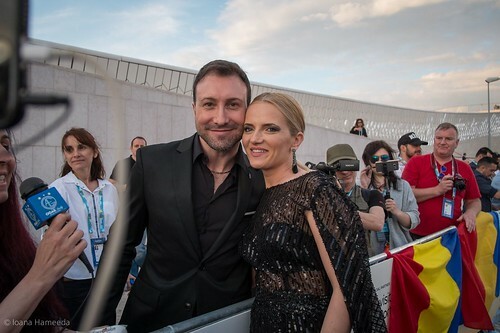 Dressed up in their designer clothes, the representatives of the 43 participant countries at the Eurovision have met with journalists, the fans and of the curious who have gathered on Sunday evening in front of the Arts, Architecture and Technology Museum from Lisbon. The colour of the carpet was changed for the first time at the 63rd edition, in order to perfectly match the serene landscape given by the Tagus River. During the 300 metres of blue carpet, The Humans have impressed the public and have offered many many interviews for two hours. Then, later in the evening, they have participated at the reception offered by the organisers. „We came here in order to win, so we have announced the public to buy airplane tickets for Romania in good time, to be sure that we will meet again in the same formula in Bucharest as well” have the artists declared in the end of the parade, being confident in Romania’s chances on the Eurovision stage. The moment of the evening took place in front of the journalists and of the Romanian fans sector, where Cristina has been waited by her boyfriend, Rosario. Holding a red rose in his hand, the one who stands besides her, for 8 years, has asked her to marry him in front of hundreds of witnesses present at the ceremony. „I am overwhelmed. It is a unique moment, an experience I will never forget, and Rosario’s surprise to renew his marriage proposal, right here, right now has turned this day into one of the most beautiful days of my life”, has Cristina witnessed, visibly touched. Romania’s delegation has marched in a special manner at this year’s Opening Ceremony. As an act of fair play, we could see together with the 6 artists Adrian Tănase - the lead vocal of The Humans band - who was not been able to participate at the contest due to the limitation to 6 persons stipulated in the Eurovision rules. I picked up some vocal issues with FYR of Macedonia and Belarus was in my view a little nervous, so those will need to do better for the public. The big winner of the night was Cyprus who smashed her performance under live pressure and gave it even more. The betting markets have reacted accordingly, and Cyprus, I repeat Cyprus, is now the favourite to win Eurovision.